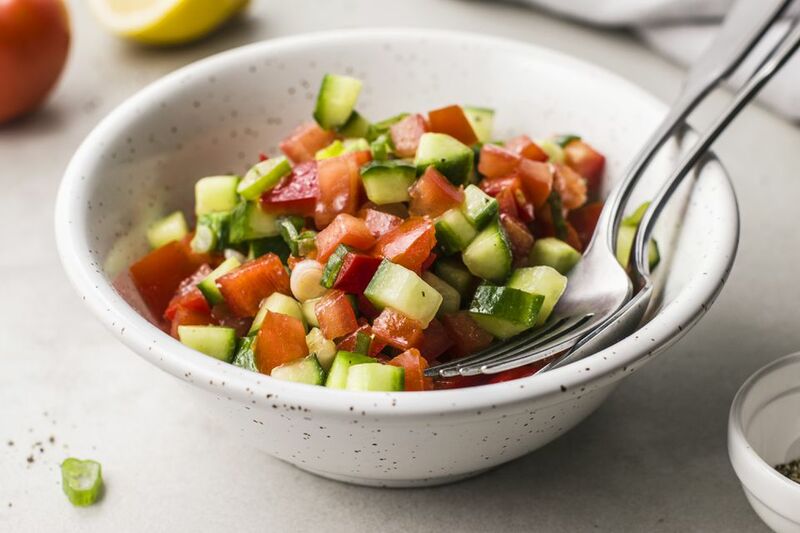 This chopped tomato and cucumber salad is so iconic of Israeli cuisine that it has been dubbed "Israeli Salad," and shows up on the table any time of day—breakfast included. And it's virtually impossible to imagine stuffing a falafel sandwich or enjoying some freshly baked pita and hummus without it. The truth is, Israelis aren't the only ones who appreciate this simple salad–you'll find similar ones throughout the Middle East and Mediterranean region. Some include fresh herbs, other vegetables, or vinegar. Giora Shimoni's version is nice and simple and makes a great template for embellishment with herbs, cheese, pine nuts, chickpeas, or whatever else strikes your fancy. His only advice? Shimoni says "the secret to a really good Israeli salad is finely chopped vegetables." As for seasoning, he notes "Israelis tend to sprinkle on quite a bit of salt." If you're watching your sodium intake, try sprinkling on some za'atar instead—you'll end up adding more flavor and less salt, especially if you make your own spice blend. In a large bowl, toss together the chopped tomatoes, cucumbers, pepper, and scallions. Immediately before serving, season with olive oil, lemon juice, salt, and pepper. Toss well, taste, and adjust the seasonings if desired. Leftover salad will keep, covered in the refrigerator, for 2 to 3 days. Small Persian cucumbers and seedless English cucumbers are ideal for this recipe, as they have a crisper, denser texture and thinner skin than American cucumbers. If you've only got American cucumbers on hand, cut them lengthwise and scoop out the seeds before chopping. If the skins are thick and/or waxy, you may want to peel them first.